We're very excited to announce our Sponsor of Friday Follow and a GIVEAWAY just for our Friday Followers! Please grab BOTH buttons after linking up. By grabbing our sponsor button you help us to promote this new venture and keep Friday Follow going strong for everyone. Check out our Friday Follow Sponsor & Giveaway! No need to fear the dentist anymore. You can reduce the visits and make your dentist happy too. Brush with Tooth Soap®. Non-toxic, sustainable, organic and no need for a warning label. 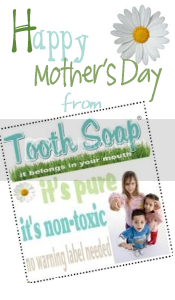 Created by a mom who has kids with no cavities. Get more information at: http://www.toothsoap.com/special-offers. Happy Friday Follow. Now following you. Have a great weekend.